Like most of the other general epistles, the title of this little book takes its name from its author. Most scholars identify the writer as Jude the half-brother of Jesus for at least two reasons. First, he identified himself as the “brother of James” (Jude 1:1), meaning he was probably not the apostle named Jude, a man who was called “the son of James” (Luke 6:16). That the author of the book of Jude identified himself as the brother of James likely aligns him with the family of Jesus. (See “Who Wrote the Book” in the chapter on James [link to James] for more information.) Second, Matthew 13:55 records the names of the brothers of Jesus as James and Judas. Whereas the gospels record his name as Judas, English translations shorten it to Jude—probably for the same reason no one in the present day wants to name a child Judas, because of the association it has with Judas Iscariot, the disciple who betrayed Jesus. Like his older brother James, Jude did not place his faith in Jesus while the Lord was still alive. Only after the crucifixion and resurrection did the scales fall from Jude's eyes and he become a follower of his half-brother, Jesus. First Corinthians 9:5 offers a tantalizing piece of information, noting that the Lord's brothers and their wives took missionary journeys. From this scant portrait, we begin to picture Jude as a man who lived in skepticism for a time but eventually came to a powerful faith in Jesus. And as he travelled on behalf of the gospel—telling the story in city after city with his name Judas butting up against that of Judas Iscariot—he would stand as a living example of faithfulness, a stark contrast to the betrayer. The book of Jude is notoriously difficult to date, primarily because the Bible and tradition reveal so little about the personal details of its author while the book itself refrains from naming any particular individuals or places. The one clue available to present-day readers is the striking similarity between the books of Jude and 2 Peter. Assuming Peter wrote his letter first (AD 64-66), Jude probably wrote his epistle sometime between AD 67 and 80. Jude's edgy brevity communicates the urgency of his notion that false teachers needed to be condemned and removed from the church. Few words meant that Jude would not waste space dancing around the issue. He saw within the church people and practices that were worthy of condemnation, including rejecting authority and seeking to please themselves. In response to these errors, Jude marshalled much biblical imagery to make clear what he thought of it all—anything from Cain killing his brother Abel to the punishment of the sinful people who populated Sodom and Gomorrah (Jude 1:7, 11). 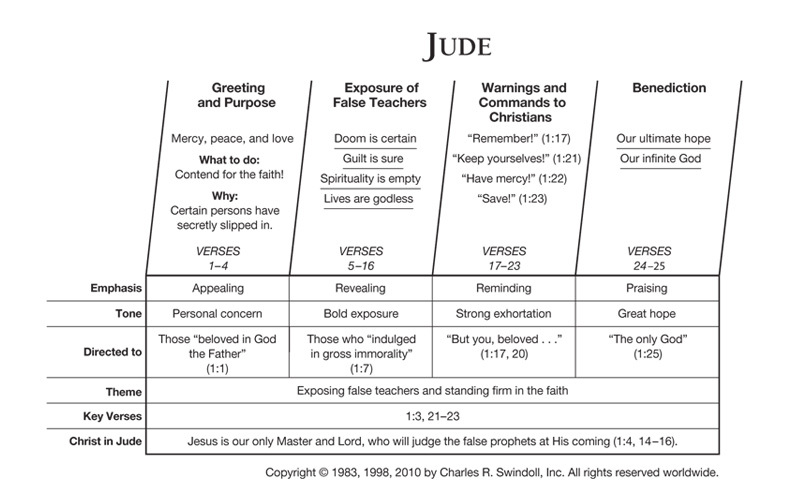 Jude's purpose in his letter was twofold: he wanted to expose the false teachers that had infiltrated the Christian community, and he wanted to encourage Christians to stand firm in the faith and fight for the truth. Jude recognized that false teachers often peddled their wares unnoticed by the faithful, so he worked to heighten the awareness of the believers by describing in vivid detail how terrible dissenters actually were. But more than simply raising awareness, Jude thought it important that believers stand against those working against Jesus Christ. Believers were to do this by remembering the teaching of the apostles, building each other up in the faith, praying in the Holy Spirit, and keeping themselves in the love of God (Jude 1:17, 20-21). Find resources in the book of Jude in our resource library.